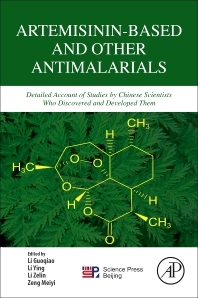 Artemisinin-Based and Other Antimalarials: Detailed Account of Studies by Chinese Scientists Who Discovered and Developed Them provides a historical and scientific background of the discovery and development of artemisinin, artemisinin derivatives, combination drugs and related chemicals. It is a historical document, a scientific treatise, and a fascinating description of innovative research on new drug development that is carried out under extremely difficult conditions. The book also includes detailed experiments, physical-chemical procedures, practical methodologies and clinical trials. It is a valuable reference for students and researchers in the fields of scientific history, medicine, pharmaceutical science, chemistry, pharmacology and toxicology. Professor Li graduated from Guangdong College of Traditional Chinese Medicine in 1955. He has more than 50-years experiences on Qinghaosu (artemisinin). He is the first to prove artemisinin’s curative effect on falciparum malaria and severe malaria, and contribute in qinghaosu (artemisinin) research in Project 523. He devised and researched a series of artemisinin-based combinations: dihydroartemisinin-piperaquine phosphate-primaquine combination (CV8) which was registered and produced in Vienam in 1997. It was the first-line treatment drug for malaria and given for free in Vietnam. Dihydroartemisinin-piperaquine phosphate combination, Artemisinin- piperaquine combination both have been registered and produced in China. Dihydroartemisinin-piperaquine combination was included in the 2nd edition of “Malaria treatment Guidelines” by WHO in 2010. He has published over 50 papers on malaria research and artemisinin derivatives. Professor Li graduated from East China College of Chemical Engineering in 1961 and the graduate school of Shanghai Institute of Materia Medica, Chinese Academy of Sciences in 1966 and worked in the Department of Synthetic Chemistry of this Institute for more than 40 years. She and her colleagues conducted structure modification of some active principles of traditional Chinese medicines (such as febrifugine, agrimols, artemisinin). Since 1976, she synthesized artemisinin derivatives among which artemether oil injection was developed and registered in China as new antimalarial drug in 1987 and enrolled in the 9th list of Essential Medicines of WHO for treatment of severe malaria. Her work in area of artemisinin lasted about 30 years and over 80 papers and some book chapters were published. Professor Li graduated from College of Pharmacology, Shanghai First Medical University in 1953. Li was a specialist dispatched by Division of Traditional Medicine, West Pacific Regional Office, WHO to give lecture on developing new drugs originating from herbal drugs in Vietnam in 1990. She identified the action site of plasmodium with electromicroscope autoradiography technology. She also identified that artemisinin series compounds could inhibit the metabolism of nucleic acid in plasmodium with in vitro culture. Li was engaged in studies on the pharmacodynamics, pharmacokinetics and special toxicity, such as teratogenicity and mutagenicity of artemisinim. Ms. Li was one of the main secretaries of the China Steering Committee of Qinghaosu, participating the design of the project and coordinating the work of individual research group to develop new anti-malaria drugs.